The first part of this biography is written from a unique vantage point - the gadol's mother. Rebbetzin Sara Finkel, herself a noted and beloved personality as well as a gifted writer, shares with us her memories of a beloved son whom she nurtured and watched grow into a gadol ha'dor. In the second part, Rabbi Yehuda Heimowitz, a respected author and a talmid of Rav Nosson Tzvi, examines the Rosh Yeshiva's life and incredible accomplishments - achieved by a man suffering from a debilitating disease. How did a boy from Chicago become the Rosh Yeshiva of the Mir in Jerusalem? How did he build it into the largest yeshiva in the world, home to more than 7,000 talmidim? 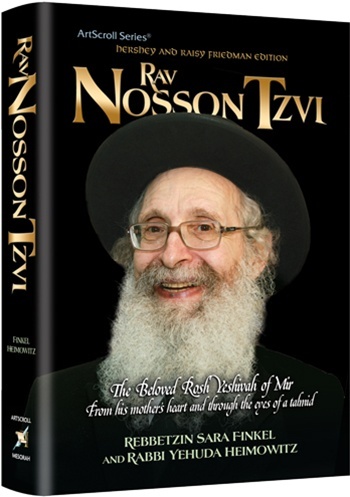 Why did the Torah world see such a vast outpouring of love - and thousands upon thousands of "Rav Nosson Tzvi stories" - in the days after his petirah? And - most important of all - how can we use the inspiration of Rav Nosson Tzvi's unbelievable efforts for Torah to transform our own lives? With more than 100 photographs, many of them rare, and based on dozens of interviews with family members, talmidim, and rabbanim who worked together with him, this is a biography that is at the same time comprehensive and touching, carefully-researched and unbelievably moving: a fitting, multi-faceted tribute to a multi-faceted gadol b'Torah.